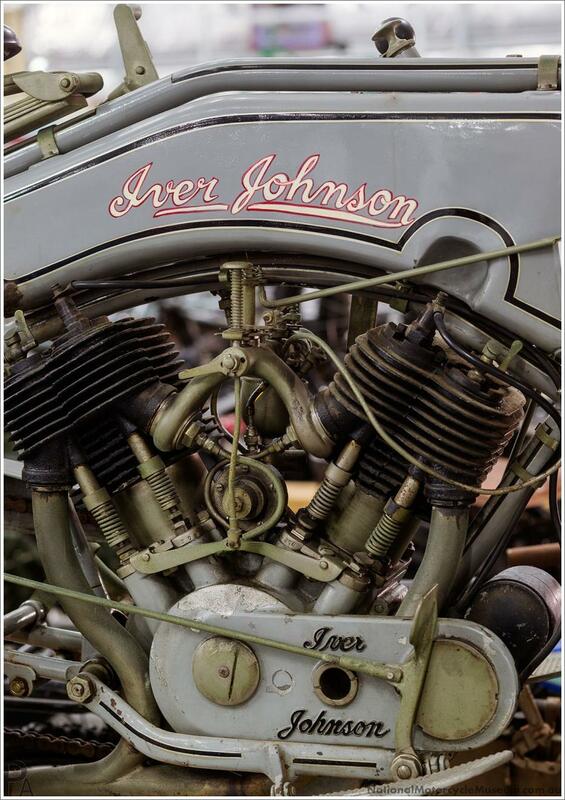 An Iver Johnson V-twin of circa 1914. Iver Johnson was a Norwegian gunsmith who emigrated to the US in 1863. He started a gunsmithing business in Massachusetts and then, in 1884, added bicycle manufacture. Finally, after his death in 1895, his sons began motorcycle manufacturing in 1907. Two basic models were offered (both with extensive options) a 500cc single and the side valve 1020cc V-twin seen here. It featured offset crankpins and both mechanical & hand oil pumps. 8hp. Weight for the single-cylinder model is listed at 120kg - this V-twin would be somewhat more. The company concentrated on arms manufacture after 1916.